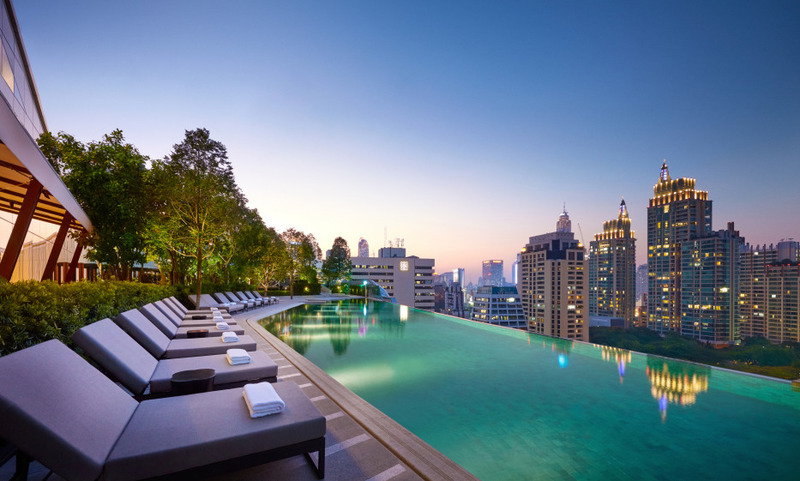 and city gazing is never quite the same: you’re on the ninth floor of the hotel, luxuriating in a 40 meter salt water pool with infinity edge, looking at the dramatic, glittering Bangkok skyline. The hotel certainly knows how to make an impression: it’s a modern minimalist affair in neutral hues, which contrasts significantly with the city’s overwhelming riot of color. Make sure to look at the statement art, especially the abstract black dragon suspended from the ceiling. Its iconic architecture: within the top floors of Central Embassy, a curvilinear structure where the floor plan forms an eight. The hotel's ideal downtown location, a short drive from the city’s two international airports and directly connected to the BTS Skytrain. Its rooftop pool, where you can swim among Bangkok's skyscrapers.